An Accident in Substance is a mammoth 3 disc retrospective of the work of Small Cruel Party representing a wealth of material. For me, it is actually the introduction to this artist who’s name I have heard floating around for years but never had the motivation to really delve into. Well, I’m glad I did because this is some simply intriguing and even at times profound material. 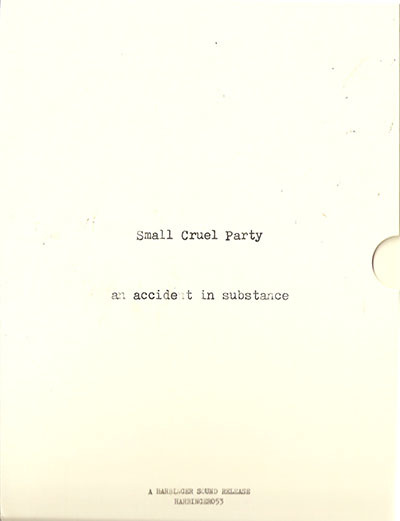 A written introduction in the packaging states that “the music of Small Cruel Party was fleshy, silly, and a little bit creepy” and I figured why say it myself if someone has already said it better than me? Luckily the “silliness” aspect is not so extroverted and maybe is a reference to live performances, or maybe is more of a reference to the playfulness which pervades the composition here. Either way, it plays a large part in what makes this material so special. Another insight into the pure sound of SCP is stated in the introduction as well: “Often, a Small Cruel Party piece is like a sculpture in progress: in the beginning, the materials are gathered, and assessed; then, a base is laid, and a rough shape hewn; and finally, the completed structure reveals itself, glowing in the fog of sound.” This is experimental sound at it’s best and that simple insight is a reflection of the quality and thought put into the composition. SCP is excellent at taking a small sound idea and working it into a texture and atmosphere. Tracks like Every Force Evolves A Form shows the simple wet delayed sounds creating a bed of mystery. Other moments like in 12 Breaths on Shore recall an almost Asian influenced instrument in it’s electronic gestures. On disc two SCP expands on his contrasting electronic/organic approach. With the bulk of the disc reminding me of what could be a soundtrack to an urban exploration outing in a desolately populated city. Tracks like Cold Hell and This Moment which mash together nature ambiences and high-pitched electronic drones first seem at odds but then fall into a weird kind of organic science fiction cinematic. Disc three manages to delve more into the drone side while still keeping a few textural pieces in the mix. The opener, Red, Wide And Diving is perhaps the longest track on the set clocking in at over 12 minutes. Yet this is more drone of sound rather than pitches, harmonies, and synth pads which lines up nicely with the rest of the material here. The bell like sounds in For the Coil of Copper Under Wood are also quite meditative and very well placed. All the tracks still follow the same formula and may appear to become a touch formulaic but it’s well worth the trip as the sounds are really the focus here and the compositions shift more on a level of subtlety following the sounds. This box set has served as an excellent introduction to the project as well as a stunning retrospective. These are truly unique atmospheres that simply have not been replicated in any other way. As SCP’s live sets are described in the account featured on the inside sleeve; I wish I had been able to experience them because the works definitely can be heard to have deeper meanings and statements behind them. A must have for any fans of experimental, musique concrete and avant garde.